The first law of giving is of the spirit world. Give to all you meet, or whose lives touch yours, of your prayers, your time, yourselves, your love, your thought. You must practice this giving first. Then give of this world’s goods and money, as you have them given to you. To give money and material things, without having first made the habit daily, hourly, ever increasingly, of giving on the highest plane, is wrong. Give, give, give all your best to all who need it. Be great givers–great givers. Give as I said My Father in Heaven gives. He who makes His sun to shine on the evil and on the good, and sendeth rain on the just and on the unjust. Remember, as I have told you before, give according to need, never according to desert. 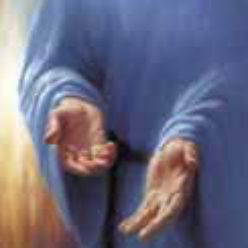 In giving, with the thought of supplying a real need you must closely resemble that Father in Heaven, the Great Giver. As you receive, you must supply the needs of those I bring to you. Not questioning, not limiting. Their nearness to you, their relationship, must never count. Only their need is to guide you. Pray to become great givers.